The Office for Metropolitan Architecture’s (OMA) concert hall, Casa da Musica, situated in the historical centre of Porto, Portugal has received the European Award from the Royal Institute of British Architects (RIBA). The European Award is the first major award that Casa da Musica has won since opening its doors to the public in the spring of 2005. Casa da Musica is now in the running for the coveted RIBA Stirling Prize. This award is presented to the architect of a building that has made a significant impact for the evolution of architecture in that particular year. OMA won the competition for the Casa da Musica as part of Portos program to initiate and prepare different urban and cultural interventions for the city of Porto during its time as European Capital of Culture in 2001. The building contains two shoe box shaped auditoriums. The voids created by these two concert spaces is used as a public space with 8 rehearsal rooms, IT and educational facilities, a music shop and rooms with recording facilities. The uniqueness of this building is also expressed through its concrete and glass faceted exterior, complete with an intimate roof terrace that offers views over the city of Porto. 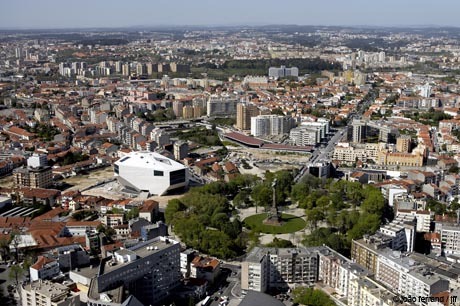 We are proud of the result of this collaboration with the City of Porto. This building offers the city not only a dynamic music hall but also a vibrant public space, Mr Koolhaas said. Other international awards won by OMA include the Pritzker Architecture Prize in 2000, the RIBA Gold Medal (UK) in 2004 and the Mies van der Rohe  European Union Prize for Contemporary Architecture, 2005.